This is the E12-0 Standard Model Rocket Engines/Motors from Estes. Suitable for Ages 10 & Older with Adult Supervision for Those Under 12. Do not burn, soak in water to destroy. Due to small parts that could cause a choking hazard please keep away from children 3 years of age and younger. For your safety and enjoyment, always follow the NAR Model Rocketry Safety Code while participating in any model rocketry activities. Residents of California, New Jersey, Rhode Island and North Dakota please review the Terms of Sale for state specific restrictions. Estes products may contain chemicals known to the State of California to cause cancer, birth defects or other reproductive harm. This is a B6-6 B-class single stage model rocket engine designed to launch model rockets. 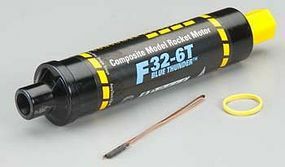 This is the F32-6T 24mm x 95mm Single Use Composite Model Rocket Motor from AeroTech Consumer Aerospace. Package contains 1 AeroTech F Engine. This is a 1/2A-class 1/2A3-4T single use mini model rocket engine from Estes. For use in single stage model rockets. This is the F35-8W 24mm Reloadable Motor System from AeroTech Consumer Aerospace. For use with kits designed for Black Powder "E" Motors. 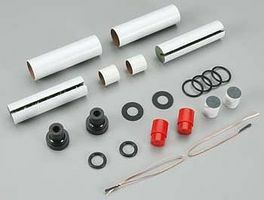 Package contains 2 Aerotech F size Reload motor kits. The very first Estes almost-ready-to-fly rocket! One-piece fin unit! Still a favorite! 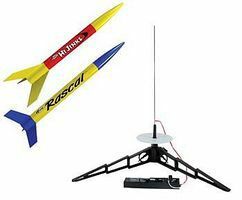 This is the Rascal & HiJinks Model Rocket Launch Set from Estes. Suitable for Ages 10 & Older. Adult Supervision for Children Under 12. 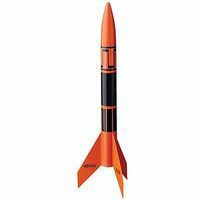 This is the Firestorm Flying Model Rocket by Estes. This is the Hi-Flier XL Rocket Kit from Estes. Suitable for Ages 10 & Older with Adult Supervision for Those Under 12. Skill Level 2 Rocket Kit. For over 30 years, the Alpha has been the first choice for millions of rocket modelers. Easy to build, rugged performance, parachute recovery - the perfect model rocket kit to get you started! Features die-cut balsa fins. Flies to 1200 feet! 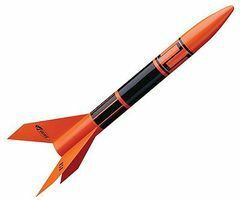 The Estes 220 Swift is a super high performance, mini engine powered model rocket with attitude that really knows how to rip through the sky. Great things come in small packages has never been more true than with this little devil. This mini rocket is as sleek as they come and can reach amazing launch heights when used with our economical mini engines. This is the D12-0 Standard Model Rocket Engines/Motors from Estes. Suitable for Ages 10 & Older with Adult Supervision for Those Under 12. Do not burn, soak in water to destroy. Due to small parts that could cause a choking hazard please keep away from children 3 years of age and younger. For your safety and enjoyment, always follow the NAR Model Rocketry Safety Code while participating in any model rocketry activities. Residents of California, New Jersey, Rhode Island and North Dakota please review the Terms of Sale for state specific restrictions. Estes products may contain chemicals known to the State of California to cause cancer, birth defects or other reproductive harm. Use this launch controller to launch "E" engine powered rockets. Comes complete with safety key and 30 ft. (9 m) of cable. This is a replacement B6-0 Estes Model Rocket Engine. Recommended for ages 10 and over with adult supervision for ages 12 and under. This package contains 4 BT-20 body tubes made of high quality spiral wound paper. This is a 15" Plastic Parachute for Model Rockets from Estes. Suitable for Ages 10 & Older with Adult Supervision for Those Under 12. This is the D12-7 Standard Model Rocket Engines/Motors from Estes. Suitable for Ages 10 & Older with Adult Supervision for Those Under 12. Do not burn, soak in water to destroy. Due to small parts that could cause a choking hazard please keep away from children 3 years of age and younger. For your safety and enjoyment, always follow the NAR Model Rocketry Safety Code while participating in any model rocketry activities. Residents of California, New Jersey, Rhode Island and North Dakota please review the Terms of Sale for state specific restrictions. Estes products may contain chemicals known to the State of California to cause cancer, birth defects or other reproductive harm. This is the Crossfire ISX Rocket Kit by Estes. Suitable for Ages 10 & Up with Adult Supervision for Under 12. Skill Level 1 Rocket Kit.